I can't wait. One of my favourite styles, sometimes described as the Tanzanian take on Congolese rumba, is finding a decent release through the Buda Musique label and the good work of Werner Graebner. I can't locate a tracklist just yet but Doug Paterson posting at over at African Ambiance assures us that "Zanzibara 3 will have 17 tracks and 4 of those are on POLP 508. All the songs were recorded by Mzuri records or RTD." So expect some sweet musiki wa dansi from the likes of Jamhuri Jazz, Nuta Jazz, Atomic Jazz, Dar es Salaam Jazz, and Morogoro Jazz. 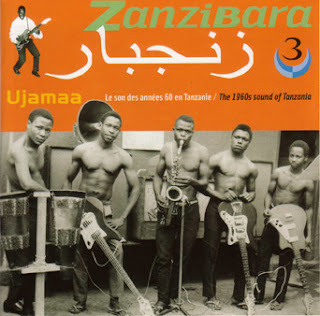 The craze for dance music - musiki wa dansi- began in Tanzania in the early 1930s. Cuban rumba records were all the rage and the urban youth organized themselves into “dance clubs” like the Dar Es-Salaam Jazz Band founded in 1932. With legacy of the earlier brass band fashion, the earliest instrumentation added brass instruments to the bush-hammer of local drums. Strings followed - violins, banjos, mandolins and guitars… The recordings in this collection date from 1968 to 1973, in many ways the transitional period for the country. I, too, can not wait for this one and have been pestering folks for a release date. hmmm... so what's this? the Ethiopiques of muziki wa dansi? i cant wait to listen to this!